He is a man who can't connect with the women he sleeps with, she is a woman who can't find love, Perfect Sense is a film which should be predictable rubbish. And, actually, for the first twenty minutes or so, it is a film that's a bit rubbish. 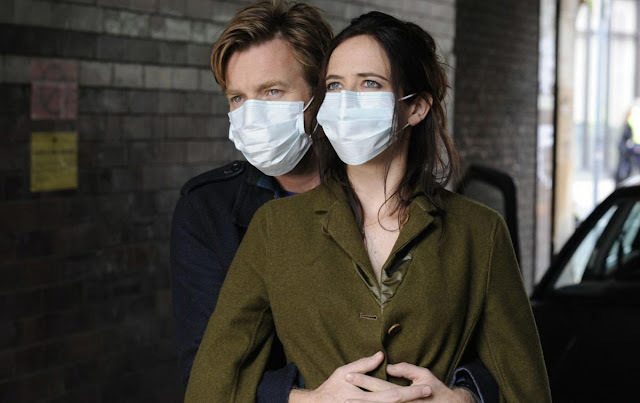 The hook surrounding the relationship between the 'he' in question, Michael (Ewan McGregor), and the 'she', Susan (Eva Green), is that they live in a world where humanity is slowly losing the use of their senses. The first to go is taste. The loss of the sense is accompanied by an initial symptom; a severe emotional outpouring. Whilst the sight of every grown adult in the film breaking down into tears for no discernible reason might sound touching, it is actually just, well, rather funny. As we progress though, David Mackenzie's film gets noticeably chillier. Kim Fupz Aakeson's script boils us down to our elementals. What makes us human? The ability to sense things and to react to them. The clinking of glasses in a restaurant, the buying of a meal for a friend, the shared satisfaction or distrust of experiencing a new flavour. The plot, which forces you to watch people lose a sense, step-by-step, is unsettling, even terrifying at times. The initial signs of what is to happen increase in dramatic impetus, all thoughts of the early crying game forgotten, until the crescendo is reached by McGregor who, late on, delivers an expletive-laden soliloquy of notable scriptual prowess. There are a few small missteps that remain; the montages, which seem to be there in place of newsreel footage to explain things, don't work but, even given minor quibbles like this, Perfect Sense ends up as an ambitious and touching drama, with more than a few great ideas and two fantastic performances by the lead duo. And, if it teaches you nothing else, know that, at the end of humanity, roll-neck jumpers will be ultra-fashionable again. Search your closets. I thought this was a great little film that definitely does deserve a bit more attention than it is getting. It scared me quite a bit! Definitely, the final third is chilling. It'll be 'cult' in a year or two!